Oklahoma City Thunder's Kevin Durant, right, drives past Denver Nuggets' Wilson Chandler, left, during the third quarter of an NBA basketball game Tuesday, Dec. 17, 2013, in Denver. The Thunder won 105-93. Serge Ibaka helped Oklahoma City get off to a good start. Kevin Durant and Russell Westbrook provided the strong finish. Ibaka scored Oklahoma City’s first 11 points of the game, Durant finished with 30 points again and the Thunder beat the Denver Nuggets 105-93 on Tuesday night for their seventh consecutive victory. 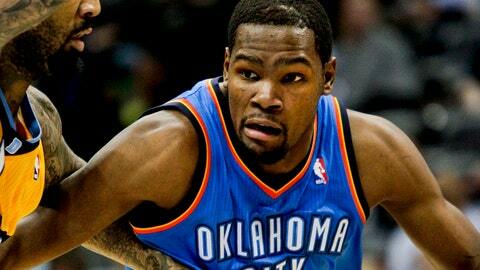 "It’s a good win," said Durant, who had 30 or more points in a game for the 12th time this season, most in the NBA. "We came here and beat a team that plays well at home and has been playing really well since the last time we played them. Any win on the road is tough, so we’ll take it." Westbrook had 21 points, 13 rebounds and eight assists, half of them in the opening minutes on feeds to Ibaka, who finished with 17 points and 10 rebounds. "Once they put two guys on myself or Kevin, our job is to make the other guys better," Westbrook said. "That’s what I did early in the game. If two guys are guarding me, then somebody is open." The shooting lanes opened up after that for Durant and Westbrook. "My teammates set me up so well and I was just trying to be aggressive because I knew I didn’t start the game off the way I wanted to," Durant said. "The third quarter is always key for us so I just put my head down and tried to score." Denver had won 10 of 13. J.J. Hickson had 20 points and 14 rebounds, but the Nuggets dropped to 0-2 this season against Oklahoma City. Ty Lawson added 17 points and 13 assists. "We made too many turnovers after the first quarter and that’s when (Thunder) made their run," Lawson said. "When they start making their runs and hitting their 3s, they are tough to stop. The third quarter we came out strong and started turning the ball over again. It was all self-inflicted." After Hickson made one of two foul shots to get the Nuggets within two, the Thunder put together a 9-0 run capped by a 3-pointer by Durant for a 69-58 lead with 4:56 left in the third. Evan Fournier broke up the flurry with a 3-pointer but Oklahoma City still led 75-65 going into the fourth. The Thunder stretched their lead to 13 points on a basket by Jeremy Lamb but Denver closed to 83-77 with 7:15 remaining, getting 10 straight points from Nate Robinson, including consecutive 3-pointers. Denver’s rally stalled from there, and Durant hit a jumper and Westbrook and Lamb each connected on 3-pointers to help Oklahoma City to a comfortable 97-79 lead with 4:28 left. The Nuggets didn’t threaten the rest of the way. Durant heated up in the last couple of minutes of the second quarter, dunking on consecutive possessions off alley-oop passes and then hitting a 3-pointer to push Oklahoma City to a 52-44 halftime lead. The Thunder led by as many as 12 points early on, going in front 37-25 when Reggie Jackson converted a steal into a fast-break layup midway through the second quarter. Kenneth Faried scored 11 of his 13 points in the first half for Denver. NOTES: Lawson has scored 10 or more points in 20 of 22 games. … The Thunder have the NBA’s longest active winning streak. … The Nuggets’ Jordan Hamilton was ejected with 11:01 remaining after being called for a flagrant foul 2 for shoving Steven Adams. … Broncos wide receiver Wes Welker watched the game in seats a few rows up from the Nuggets’ bench. … Oklahoma City improved to 15-1 when outrebounding the opposition (53-43).